The 55 European national teams have been divided into four leagues based on Uefa's national association coefficient rankings on 11 October, 2017. The draw for the first phase Nations League will take place in Lausanne, Switzerland, on 24 January, 2018. In each league, four group winners are promoted (or play in the Nations League Finals, see below) and four teams are relegated for the next competition to be played in 2020. 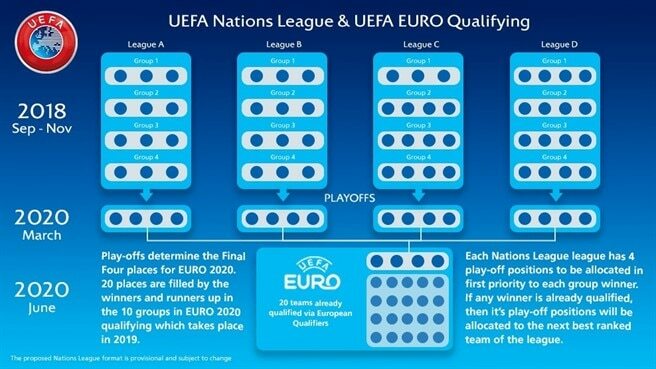 Qualifying for the Euros seems a bit complicated to me, but the actual league sounds like a good idea. We should see fewer games where the opposition just sit behind the ball and try and stifle the larger nations, while the smaller sides should be able to develop their own game and actually have a chance of picking up a few wins and getting promoted. This is what replaces "friendlies" I believe... Makes them more competitive. Cheers Dougal. I did run a search, but I didn't spot that one in the results. So some teams qualify for the euros through this, and others qualify through qualifying? The Nations League group games will be held over six matchdays, during the 'double-headers' in September, October and November 2018. The Euro 2020 qualifiers start in March 2019. There will be two matchdays in each of March, June, September, October and November 2019. Did you lot know that the Semi-Finals and Final of Euro 2020 is going to be at Wembley? That had completely passed me by. Which cities will host games? Where will the semi-finals and final be? Got to be better than friendlies? Right? Don't tell anyone else! If spurs get that far no doubt people will complain of home advantage! Even as a joke that makes little sense. They might get a few wins aswell. Downside is that kane is going to struggle to get as many international goals, upside games are going to be competitive. Other downside england don't do so well in competitive games.